It’s no coincidence that the Oracle in “The Matrix” had this ancient wisdom on her wall. It is the essence of Tarot, as well as the suite of wands. Knowing the future doesn’t figure into it except for the basic cause-effect way that living a better life, being a better person, and making better choices can bring better future and fortune. Tarot is a way for us to know ourselves. (Which begs the question, are we the universe’s Tarot cards? Ponder THAT) But without going too deep or ‘woo-woo’ , wands help us to know ourselves better so we can connect better with all the other aspects of life (with their respective suites: relationships with others, relationships with society, dealing with the physical realm) Is this to say that the suite of Wands is somehow more foundational, or more important than the others? Not at all. If any link in a chain breaks, the whole chain fails. Personal development is good, but unless it is enacted and expressed in relationships and in the physical world, it is limited. Unused and unexpressed personal growth is a shadow of what it could otherwise be. All suites have importance, and their complex interaction reflects the complexity and elegance of the human spirit. The relationship between one suite and another, between arcana, between cards and humans: these connections are symbolic, subtle, elegant and synergistic. 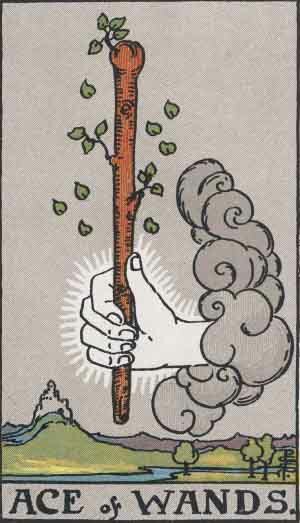 The lessons learned taught by Wands cards are in a way like the the magic wand the ace resembles. Knowing thyself can help you attract, manifest and love without resentment, without reservation – an essential magic for us all. “Know Thyself” – Socrates was on to something.